Making red wine is a laborious process that requires skill and patience. It can involve various different methods based on the particular grape being used. Wine making is a series of choices that demonstrate the winemaker's talent, knowledge, and mastery. For most of us making red wine seems pure magic. All wine making starts with the harvest of the grape. Most grape juice is white. Usually what determines the color of the wine is not the color of the juice itself, but the amount of time that the juice and the red skins of the grape are kept in contact with each other. Grapes are harvested stems and all. A decision that the winemaker will have to make early in the process is whether to keep the grapes in contact with the stems after the grapes are crushed. The grape skins, seeds, and stems provide color and tannin to the juice. If the winemaker is working with a variety of grape that already has quite a bit of tannin, he or she may decide not to keep the stems very long. On the other hand, if the grape variety has less tannin, the decision may well be that the final product will benefit from additional contact with the stems. The "must" is what winemakers call the combination of juice, grape skins, seeds, and stems. The must is placed in fermenting barrels or vats, and the magic begins. Yeasts are naturally present, but the winemaker may decide to add one of various strains of cultured yeasts. Adding cultured yeasts allows for more control in the winemaking process. While the must is fermenting, the solids will float to the top. This mass is very important because it is what gives the wine its character and style. For this reason the mass is carefully pushed down in order to have all the juice in contact with the solids. 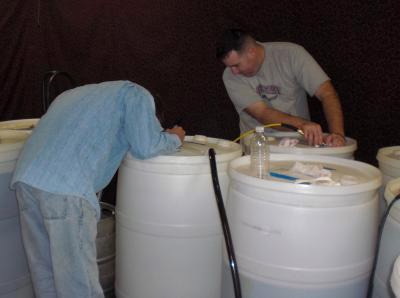 Fermentation is the process that turns the sugar in the grape juice into alcohol. The temperature of the liquid will raise to between 60ºF and 85ºF. This is a delicate step because if the temperature raises rapidly, or higher than 85ºF, the wine will be affected. Once fermentation is completed, the solids are separated from the wine. and it is placed in barrels to age. The wine will be "racked" several times. Racking is a practice in which the wine is transferred from one barrel to another in order to clarify it. After solids have settle to the bottom of the barrel, the wine will be siphoned off to a clean barrel. This may be done several times; each time letting the solids settle down. Racking also helps to aerate the wine. Some times wine is filtered. By filtering, the winemaker removes bacteria that could spoil the wine, it will also clarify it further. Some winemakers prefer to skip this step because filtering also removes desirable elements that give the wine flavor, aroma, and depth. As you can imagine, this is a crucial decision, and one that causes some level of controversy in winemaking circles. After aging in the barrels, the wine will be bottled, only to continue its aging process. Unlike barrel aging, which involves oxygen, bottle aging takes place in an inert environment. Once the wine is in the bottle, and it has a good cork place on it, the various elements interact with one another without "the outside world" influencing them. Both barrel and bottle aging are indispensable in the production of a great wine, and the best ones always go through both methods of maturation. This is the basic method of making red wine. There are other methods and variations, depending on the results sought by the winemaker and the grapes being used. It's the Magic of Making Red Wine!